This is the second book by Katrina Kittle that I’ve selected for Throwback Thursday. I read this novel when it was released in 2010. It is one of my favorite books by one of my favorite authors. I think one of the reasons it stuck with me is because at the time I could relate to many things the main character, Cami Anderson was going through. I was instantly engulfed in the story within minutes of starting the book. Cami Anderson is a small town vet who’s devoted to animals. She is devastated when her husband decides to leave their marriage and becomes involved with a younger woman. Cami does however, find much comfort in the motley crew of abandoned and abused animals she has found and given a home to over the years. As an animal lover, I loved the connection Cami had with all of her animals. It was especially amazing how her and her horse, Moonshine helped heal each other. The resilience of the human spirit and the important role animals play in healing shattered emotions is so real. The human characters along with the character of the animals in this book were so unique and well-defined. Katrina Kittle has a special way of bringing characters to life that comes across in a genuine way. Drawn in from the very first page, I read this book in two sittings. 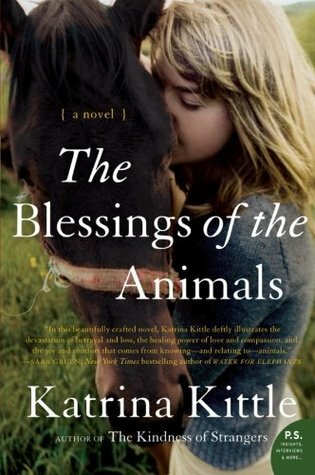 A beautifully written and thought-provoking story novel with human and animal characters I truly loved. The author’s writing style and the plot kept me gripped right up until a satisfying ending. It left me with a hopeful feeling that has stayed with me all this time. Thanks for hosting, Renee. I love this meme. I’ve noticed that when I tried to leave a message on your post that it doesn’t show up? Are you getting my replies? I’ve never read this author. Thanks for bringing Katrina Kittle to my attention. I hope you check her out. I really enjoy her books and would love to hear what you think. That looks like a very sweet book and I’m a sucker for books that include animals. Thanks! It really is a great book! I love books with animals as well. Very emotional read.